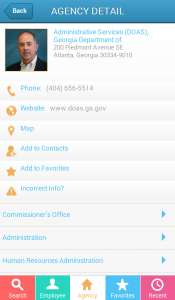 The Department of Administrative Services (DOAS) is pleased to announce that the Team Georgia Directory mobile app now features a GPS solution for citizens looking to navigate to a state government building. Looking to visit the Capitol? Need to work with the Secretary of State’s Office to answer questions about your LLC? Do you need to meet with the Department of Revenue to resolve a tax issue? 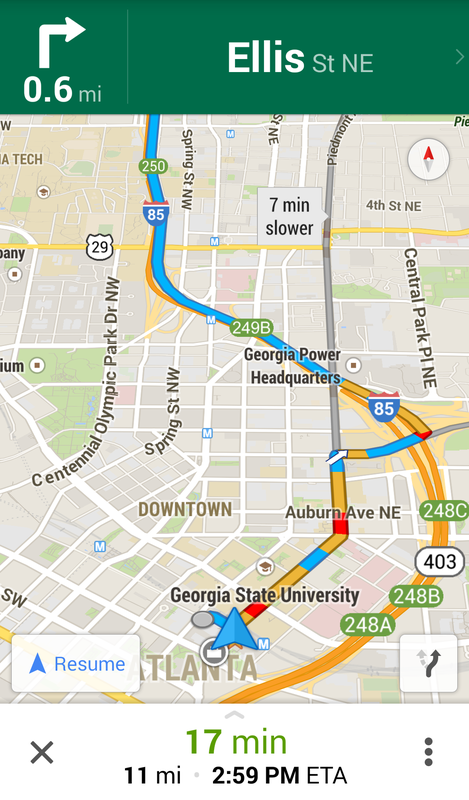 Now, with the Team Georgia Directory, not only can you look up the phone numbers or email addresses necessary to make those appointments, you can use the “Map” feature to get directions and navigate directly to that government office. As with the other options provided by the Team Georgia Directory, the new GPS feature aims to make Georgia’s state government more accessible to citizens. Moreover, because each agency maintains its own contact information, the details are as up-to-date as possible — allowing state agencies to serve up relevant information and fast customer service! By now, you should already notice the new “Map” option on the details screen of contacts within your Team Georgia Directory mobile app. If not, you may need to check your app store to see if you have “Updated” to the latest version. 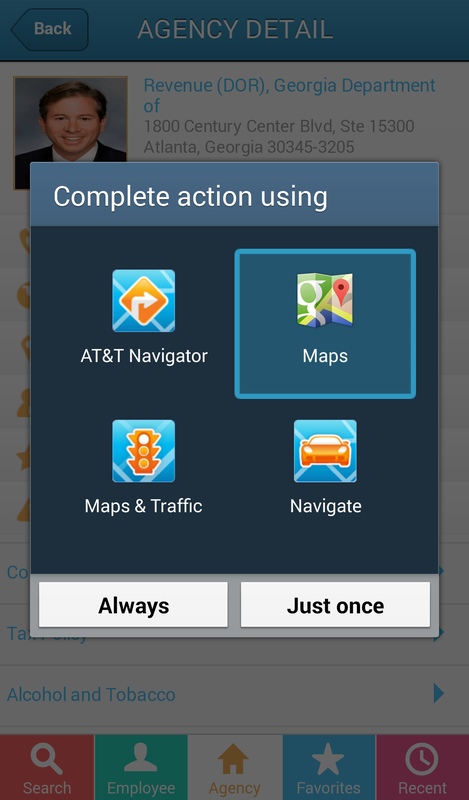 Once you click the “Map” icon, you should be presented with a screen to choose which third party navigation tool you would like to use to map your course to the office location. If you want to save a location for later use, you can always “Favorite” that agency directly in the Team Georgia Directory app. If you’re worried about having offline access to an address, you can always print all, or just a part of, the directory – or even save the map location for offline reference. The Team Georgia Directory launched in January and puts the most up-to-date state contact information at your fingertips. Listing more than 100 state agencies and executive offices, the directory has a range of information including facility locations, phone numbers, email and website addresses, and an index of Georgia’s state leadership. We hope you enjoy your experience with the Team Georgia Directory web and mobile apps. 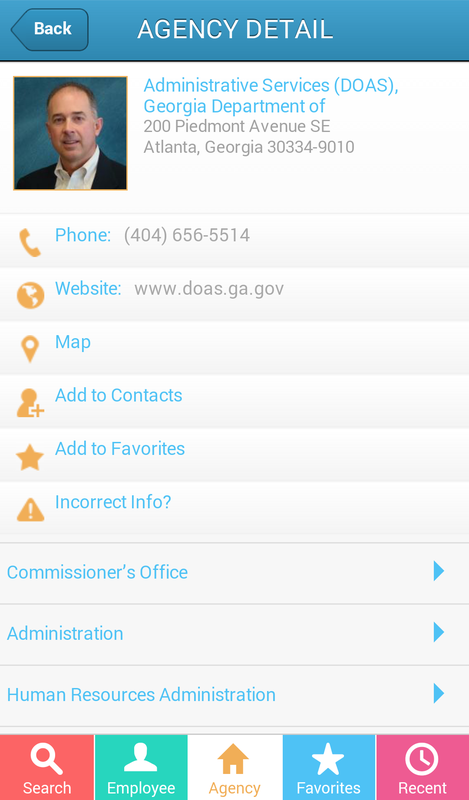 If you have questions about the new Team Georgia Directory, please contact our help desk at doasithelp@doas.ga.gov.